I arrived in Guwahati almost 6 weeks ago. I am slowly getting to know this city and its kind and gentle people. This post is about my first impressions about the city and finding my way around it. In this short time, I have fallen in love with this city? If you ask me why, I can try to give all kind of rational reasons why this city clicked for me, but they may not be true. Perhaps sometimes, we like a city instinctively, there is some mysterious magic that works? I only know that I liked it almost from the first day I landed here. The Indian mega cities are sprawling spaces full of millions of persons. Sometimes you can live in a city for months, without really knowing it. Or you can travel across the city in a metro train and know all the names of the metro stations and yet, continue to get lost on its roads all the time. That happens to me often in Delhi, a city where I had grown up. However, my first days in Guwahati were so different from my experiences in the other Indian mega cities. I was staying in a hotel in a quiet part of Uzan Bazar, close to the High Court. The views of the river Brahmaputra, and numerous pukhris (ponds) that are scattered in this part of the city, were magnificent. The vegetable market along both the sides of the street seemed exactly like the vegetable markets of my childhood from the summer holidays in West Bengal. The small hills were covered with lush green foliage. Later, I could discover many other such markets in different parts of the city. 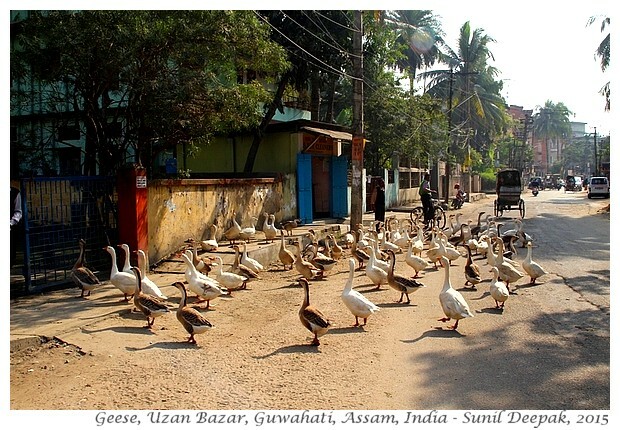 And on my first morning in Guwahati, I saw a gaggle of about 20 geese waddling out of a pond and walking leisurely in the middle of road, uncaring about the autos, motorcycles and bicycles that went around them, occasionally stopping to look curiously inside the houses and at people. At that moment, I knew that I loved this city. Guwahati has less than 1 million persons. That may be enough to compare it with the second level of large European cities. However, compared to the Indian mega cities like Delhi, Mumbai or Bangalore, it is tiny, almost a provincial backyard. If you consider that Guwahati is the biggest city in all the 8 North-Eastern states of India, you can understand that we are talking of human-size cities here and not those never-ending crazy mega cities which dwarf you and make you feel like an anonymous nobody. To understand the basic layout of the city, you need to remember just two main roads that meet at the Guwahati railway station in Paltan Bazar, and make an “L” – A.T. road and G.S. Road. 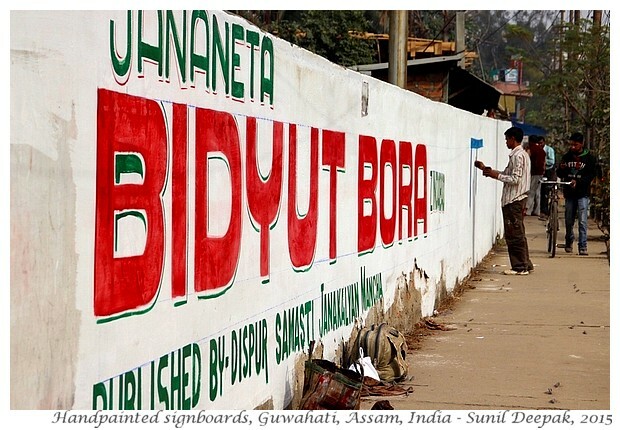 On the north, across Brahmaputra, A.T. road comes to Guwahati from the west (Bongaigaon and West Bengal). It enters the city along the south bank of river Brahmaputra, passes in front of the railway colony and the Kamakhya temple on the top of a hill. At Muchokhowa it leaves the river and goes inside, passing through 4 important city markets - Fancy Bazar, Pan Bazar, Uzan Bazar and Paltan Bazar. At Paltan Bazar, it changes name and becomes G. S. Road. 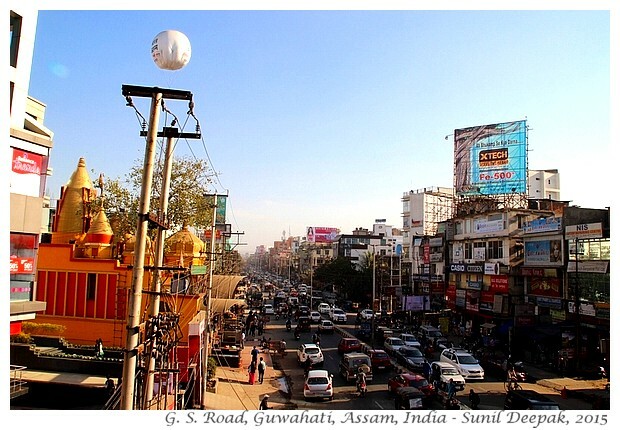 The G. S. road (Guwahati-Shillong road) starts in front of Guwahati railway station when A.T. road takes a sharp 90 degrees turn to the south. It connects the railway station to Khanapara, where hills start and Guwahati ends. After the exit for Shillong, G.S. road again becomes A.T. road and continues towards eastern (or as locals call it "upper Assam") cities of Nagaon, Jorhat and Tejpur. Inside Guwahati, G.S. road is the most important road of the city. It has 4 flyovers – Ulubari flyover, Bhangagarh flyover, Ganeshguri flyover and Six Miles flyover. 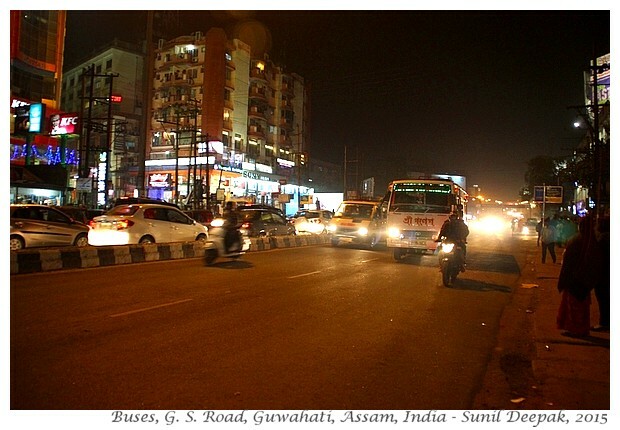 To understand Guwahati you just need to remember these flyovers and the roads leading from there. 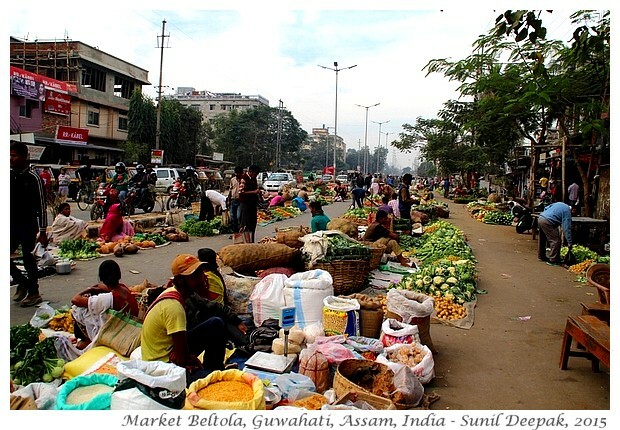 To identify most areas of Guwahati, you can get instructions in terms of some market or flyover on the A.T. road or on the G.S. road. Travelling in Guwahati is easy, buses cover the whole G.S. road-A.T. road stretch. For almost everywhere else, you can find connecting buses along these 2 roads. Along the main roads, the fares vary between 5 to 15 rupees. Most bus operators are private who try to get as many passengers as they can, so they often stop for long time at each important bus stop, calling to people to come and sit in their buses. This means that it is easy to get into the buses, though they may take long time to reach anywhere. A journey that could have been completed in 30 minutes, sometimes takes 60-80 minutes. Often passengers, irritated by long waits, thump with their hands on the sides of the buses, but most drivers are really cool about it, they stay relaxed. In addition to the driver, all buses have 2 guys – one for collecting fares and the other for calling passengers at the bus stops. They also thump continuously on the side of the buses with their hands – one thump means “don’t move, a potential passenger is coming”; two thumps mean “go”. Inside the buses, the left side seats are reserved for women. If there are no women standing and seats are available, men can sit there but they must get up immediately as soon as a woman enters the bus. The ticket checkers take only cash and do not give any tickets, but they seem to remember who has paid and who has not paid. As a white-haired person, often persons get up and give their seat to me. People are generally very helpful and gentle - I have yet to meet a really rude person in a bus. Compared to the buses, the autos (3 wheeler auto-rickshaws) are completely unpredictable. In areas that do not have buses, you can find “shared auto” where 6-7 persons travel in an auto, like a bus, each pays 10-15 Rs and people can get and get out along the way. Longer journeys by “reserved autos” (an auto reserved only for you and your companions), cost quite a lot according to the whim of the auto-drivers. For the same journey, at different times of the weekday or weekend, I have paid amounts varying from 150 to 250 Rs. Taxis are not so common – in the last 6 weeks, I took them only twice. Some persons believe that Guwahati city is not the capital of Assam but only the Dispur area where the Government has its offices, is the capital. 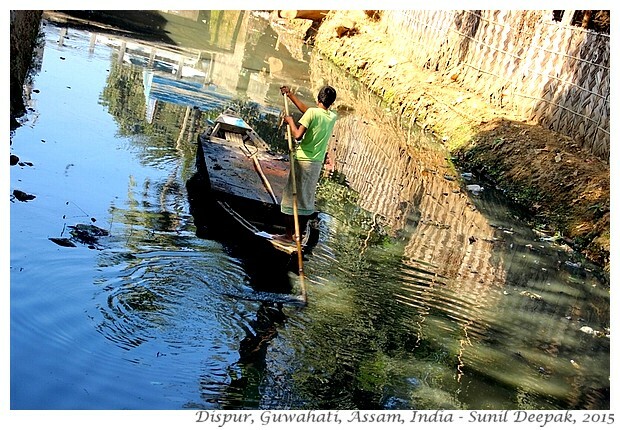 Dispur is a small area of Guwahati between Ganeshguri and Six Miles flyovers on the G. S. road. 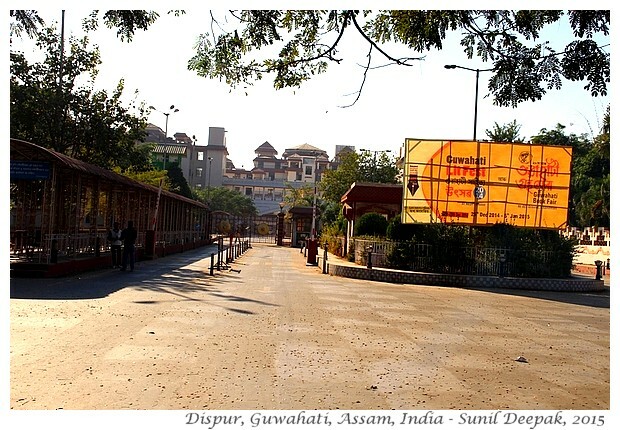 Initially I was a little confused when I was told that Dispur was the capital of Assam. I had thought that perhaps Dispur was another new city that has been built as the new capital. Then I found that it is only a small part of the Guwahati city. 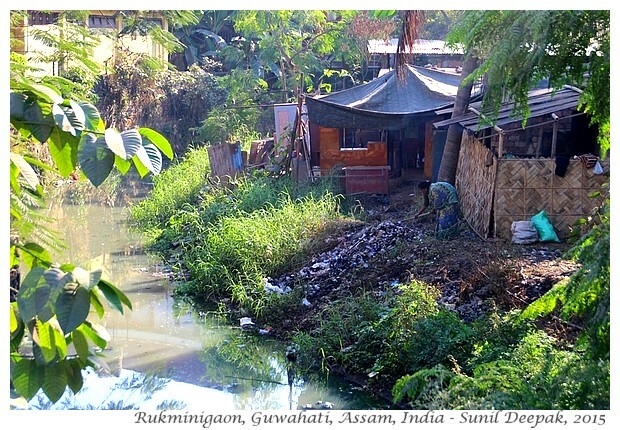 Guwahati as the capital of Assam has woefully inadequate infrastructures. It is the gateway to whole of the North-East but decent roads or bridges are inadequate. Outside Guwahati, travelling a few hundred kilometres can often take 3-4 hours, most of them stuck in some place or moving at snail pace. For example, the city has only one bridge to cross the river Brahmaputra – a parallel track is being built for the past few years, so that in future traffic will have 2 lanes in both directions. 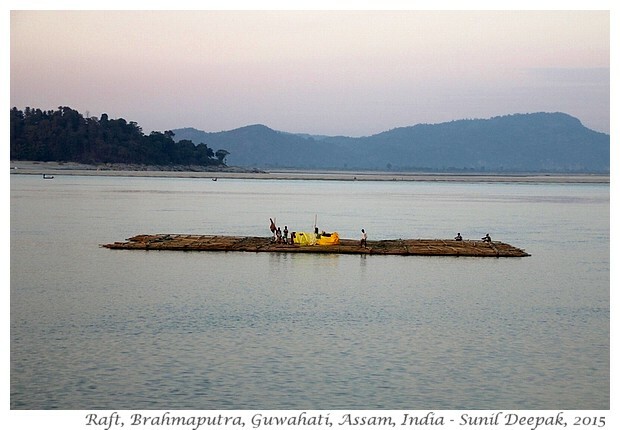 But a city like Guwahati needs at least 3-4 bridges on Brahmaputra. Railway infrastructure is also limited. There is only one rail track for crossing the river, so trains can move only in one direction at a time, and on the other side, the trains must wait to cross the river. It seems unbelievable if you think that this is a strategic area for India and that the whole region is full of Military outposts and camps. 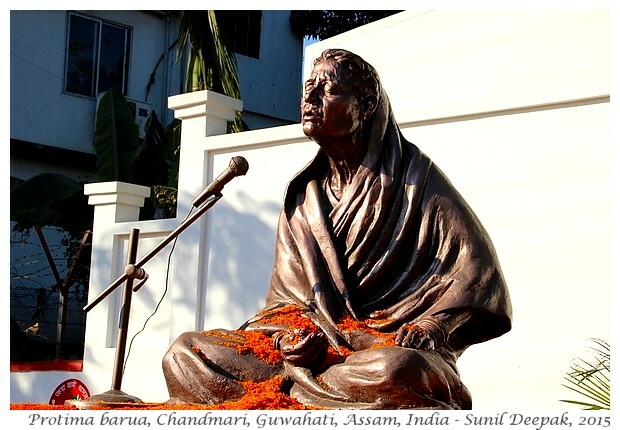 Guwahati seems to give a lot of importance to Sahitya Sabhas (literary gatherings). There are many schools of art and music. In public spaces, there are many statues remembering authors, artists and others such as freedom fighters, a rare sight in any other part of India that I have seen. 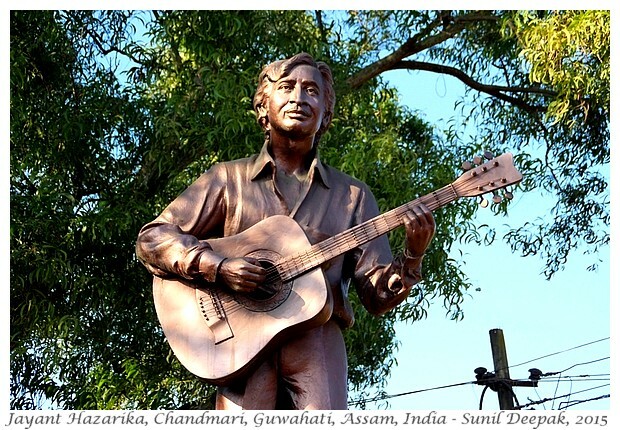 On the other hand, I have not seen many statues of the politicians that are so common in other parts of India. I love this aspect of Guwahati! A few malls with multiplexes and all kind of important brand names are there in the city with their gleaming showrooms and restaurants. However, they are still few and these new arrivals have not yet edged out the traditional places where you can eat the staple Assamese food starting with rice. The side roads of Guwahati are calm places full of lovely houses, while the main roads are blocked by markets and traffic. However as multi-story buildings are built at the site of traditional houses and as cars increase in the city, those side-roads are becoming increasingly congested. As the city will be more “developed” in the coming years, I think that more traditional heritage houses will be lost and city will struggle even more with the traffic. This thought makes me feel really sad, as some of the traditional houses are so beautiful with open courtyards and some even have tiny ponds. Garbage disposal is (especially disposing plastic bags) another growing problem in the city, likely to get worse in the future. Some of the local rivers are full of dark sewage. 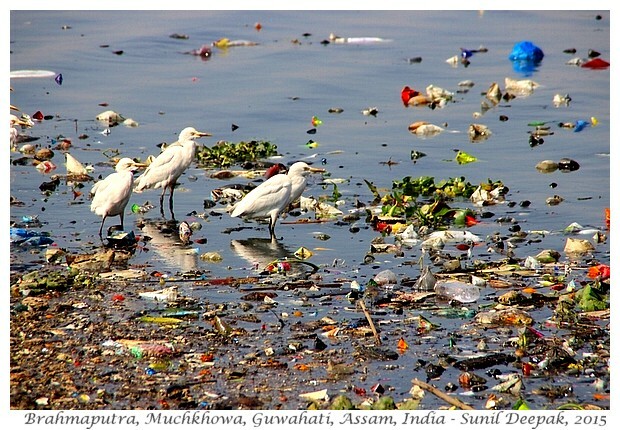 Even beautiful sites of the city, like the Umananda temple on the peacock island in Brahmaputra river, are full of garbage in some parts. At the back of the Nepali Mandir in Paltan Bazar in the city centre is a big sewage lake. As has happened in other bigger cities, slowly the traditional crafts and persons – such as those selling baskets and those hand-painting sign boards, will slowly disappear. The life along the river will also change – the poor persons who live in slums near the river, will be shifted to make way for the riverfront luxury homes. However, you can still see these traditional crafts and crafts-persons in many parts of the city. Guwahati still has some old world charm, even if it is striving to become a modern "developed" city. Unfortunately the move to become a modern city, along with the comforts, also brings with it some chaos and difficulties. I wish that the city will try to safeguard its heritage and not destroy all its traditional charm. I also hope that Government will do much more to strengthen the city infrastructures. 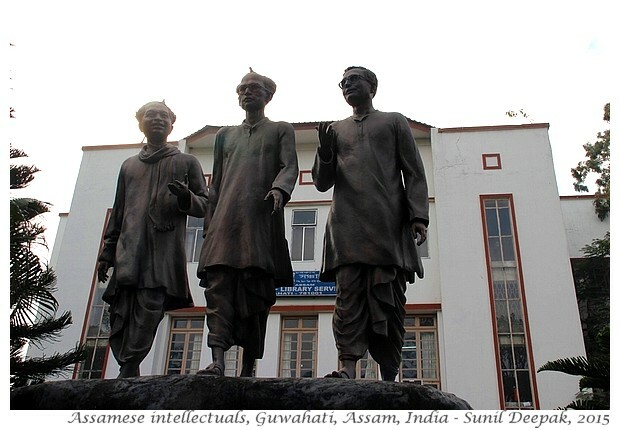 This is only a brief introduction to Guwahati, the capital of Assam. The city has many places to visit starting with the famous Kamakhya temple. I am still discovering them. I hope to write about them soon. Thanks....Very Useful one..................Sthapati Architects, Specialises in Traditional architecture in Chennai. We have also designed Temple architecture in Chennai. I was looking for it as I am planing to go to Guwahati in coming December . It will help me in my trip .